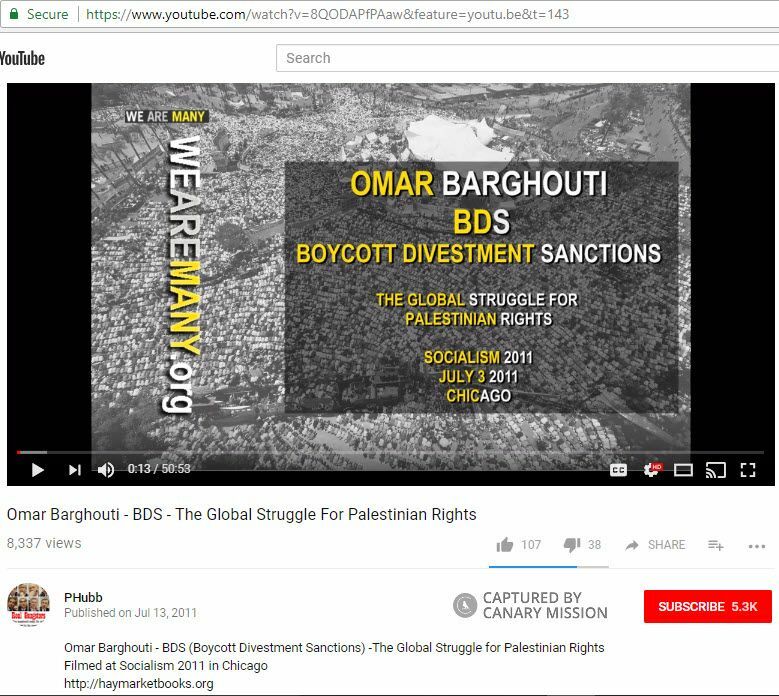 Barghouti was born in Qatar, grew up in Egypt and later moved to Acre, Israel, where he lived as of 2017. 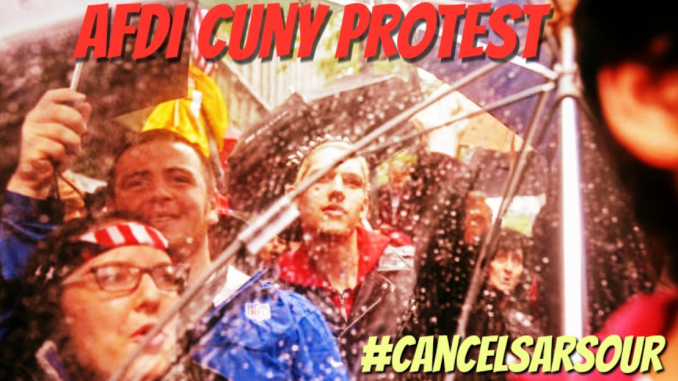 He holds two degrees in Electrical Engineering from Columbia University and a master’s degree in Philosophy (ethics) from Tel Aviv University. 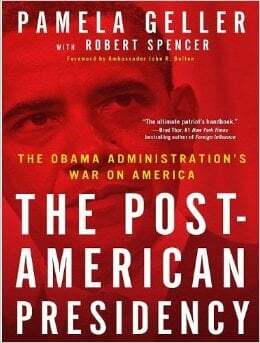 He began studying for a doctorate there in 2009 but did not finish. The second intifada was characterized by over 120 suicide bombings against Israeli civilians on buses and in cafes. The hunger strike was initiated on April 16, 2017, by Marwan Barghouti — who financed the guitar-case bomb used in the Sbarro Cafe bombing. Marwan Barghouti also headed the Palestinian Authority (PA) terrorist Tanzim force and founded the Al-Aqsa Martyrs Brigades. His organizations carried out a large number of deadly attacks, killing scores of Israelis and wounding hundreds. Marwan Barghouti was sentenced to five consecutive life terms by an Israeli civilian court for some of his his crimes. While in Israeli prison, he completed his doctorate in Political Science. More than 1,000 other Palestinian prisoners participated in the hunger strike — most of whom were also convicted for acts of terrorism, including Popular Front for the Liberation of Palestine (PFLP) Secretary General Ahmad Sa’adat. 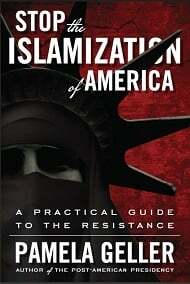 The PNIF — the first signatory listed on the 2005 BDS call — is a coalition of organizations established by terrorists Marwan Barghouti and Yasser Arafat in 2000-2001, at the beginning of the second intifada, to coordinate terror attacks against Israel by Palestinian Liberation Organization (PLO) groups and Hamas. The coalition also includes terrorist organizations such the Popular Front for the Liberation of Palestine (PFLP), the Palestine Liberation Front (PLF) and Palestinians Islamic Jihad (PIJ). 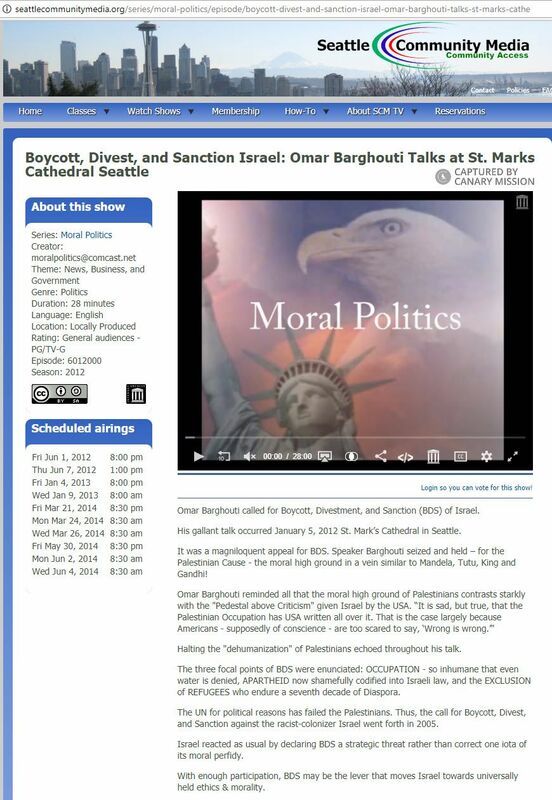 The talk was sponsored by Portland’s SJP chapter, Students United for Palestinian Equal Rights (SUPER). 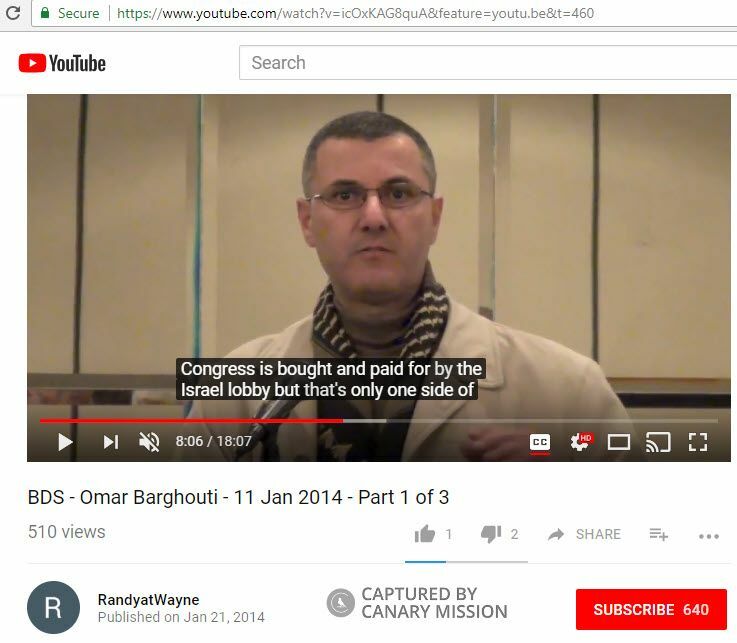 On January 11, 2014, during a talk at Wayne State University, Barghouti claimed [00:07:40] “Israel has a hold on Congress, has enormous influence on Congress, not just because the Zionist Jewish lobby or Zionist Christian fundamentalist lobbies are doing a tremendous job. 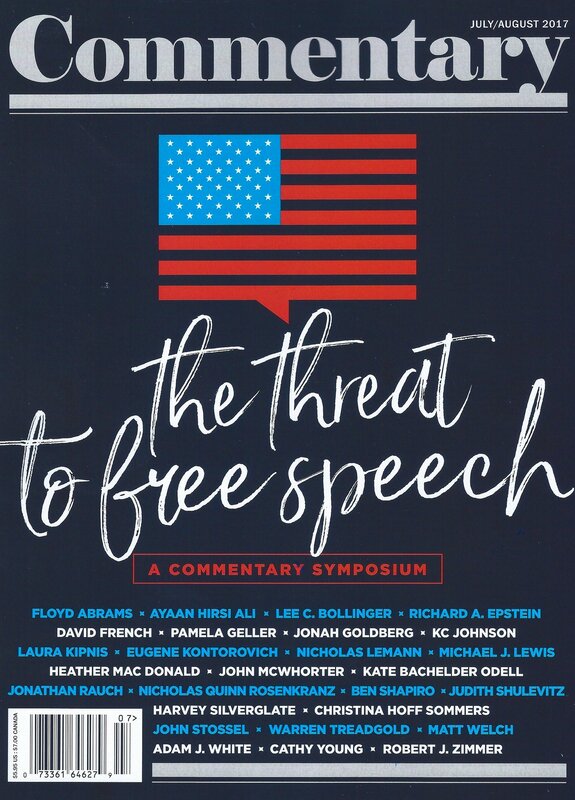 During his 2014 talk at UCLA, Barghouti reportedly denied that the Jewish people have a right to self-determination or any collective rights. 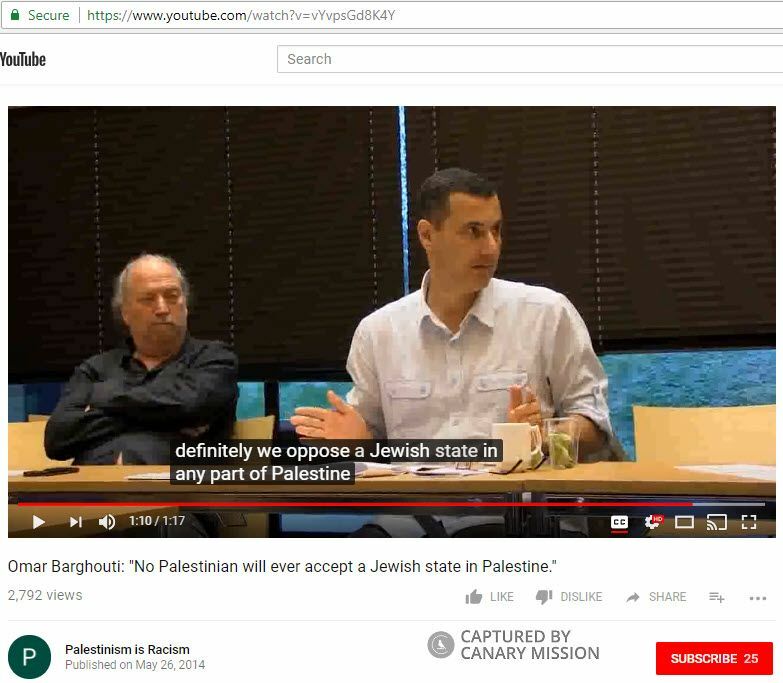 Barghouti endorses the one-state solution, which he says [00:02:17] can only come about by the “de-zionization” of Israel as the Jewish state. 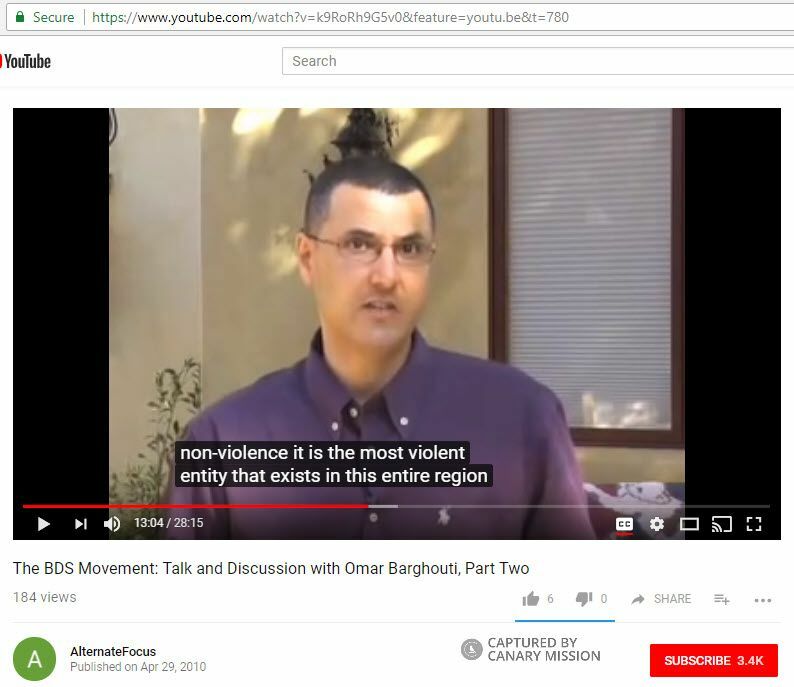 On May 31, 2009, in an interview on the Electronic Intifada site, Barghouti stated that “…a return for refugees would end Israel’s existence as a Jewish state. 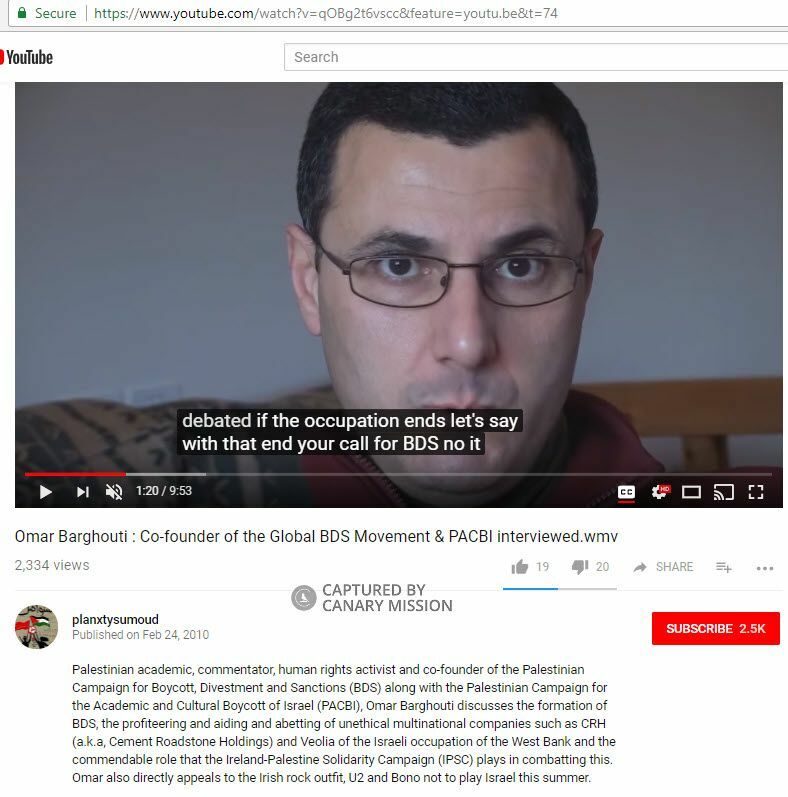 The right of return is a basic right that cannot be given away; it’s inalienable.” In 2016, Barghouti said [00:00:40] that “the need for the right of return of the refugees” was the “most important” of BDS three stated goals. The “right of return” is a Palestinian demand discredited as a means to eliminate Israel. International law mandates no absolute right of return and UN Resolution 194, which defined principles for “returning Palestine refugees to their homes,” was unanimously rejected by Arab nations following the 1948 Arab-Israeli War. 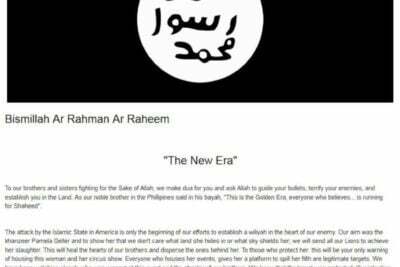 In a 2016 Portland State University speech, he said that “the U.S. intelligence community created the beginnings of ISIS” and created the Taliban and al-Qaida.